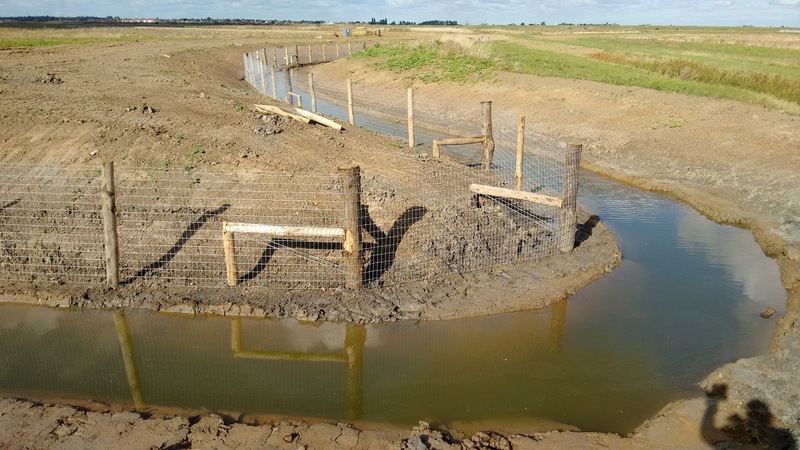 The RSPB’s wetland creation project at Wallasea Island in Essex has been much in the news over the last year. In July, the first phase of the intertidal habitat was completed and the sea wall breached. On completion of all five phases of this innovative and forward-looking project, around 700 hectares of saline to fresh water habitats will have been created. A – This will be the visitor hub in the future. 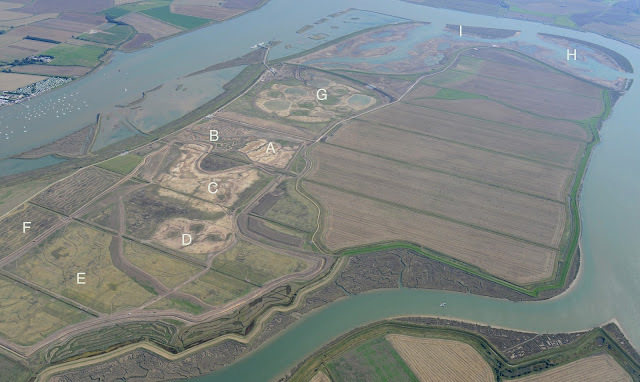 Immediately adjacent are three shallow saline lagoons that will be managed for passage and breeding waders (top photo below). They will be rotationally dried and flooded to maximize their food supply. They will provide ideal conditions for Black-winged Stilts. B – The entrance to the reserve will be through an area of saltmarsh saline creaks with shallow pools, suitable for a range of specialist invertebrates. C – Shallow saline lagoon with islands and seasonal brackish pools suitable for breeding birds and a range of characteristic flora and fauna. The conditions will be suitable for species currently more frequent to the south and that are likely to move northwards. D – Seasonally drying salt pan, for Kentish Plovers with a bit of luck. E – Freshwater marsh and grassland with pools and ditches for breeding waders. These areas will be protected from mammalian predators by a barrier fence built into the surrounding ditches (see photo below). F – Rough grass and wild-bird cover around the margins of the wetland will provide habitat for small mammals, reptiles and invertebrates. 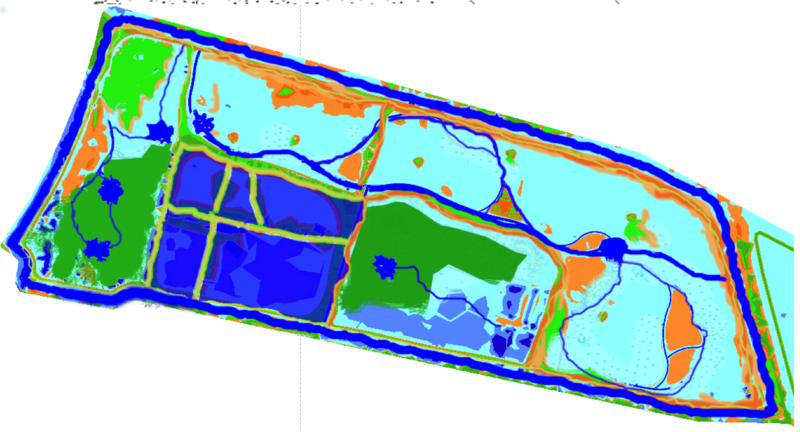 The photo shows the mosaic cutting pattern to increase the structural diversity of the rough grassland. This will also benefit birds of prey such as harriers and owls. G – An area of regulated tidal exchange with numerous islands, where water levels can be controlled (see sluice photo below) for the benefit of breeding, passage and wintering waterbirds. H – The inter-tidal area has numerous features designed into it, including shallow lagoons that will provide the ideal feeding conditions and food resource for Spoonbills. Once fed-up and in the mood, higher islands with scrub have been provided for the Spoonbills for nesting. I – The range of islands provided includes some with shingle, sand and cockle-shells for nesting terns (hopefully Little Tern) and Ringed Plovers. Will it all work? We shall see.